Today we will be review Only Natural’s Moringa Pure supplement. The company states this product can be used to contribute to overall health and also gives the body the essential vitamins and minerals it needs. The product does not contain artificial flavors, colors, or preservatives. If you are wondering whether or not this product lives up to its claims or if it’s ideal for you, please keep reading this review to learn more. The recommended dosage for this product is 2 capsules one to two times daily before you eat with a glass of water, unless directed otherwise by your doctor. Since this is a natural product, you should not experience any side effects. However, since everyone is different, your experience may differ from others. If you are unsure about taking this supplement, are pregnant or nursing, currently taking another supplement or prescription medication, or someone with a medical condition, you should first speak with your doctor before you take this product. If you notice any adverse reactions, you should immediately discontinue use. The original listing price for this product is $19.99. However, the authorized retailer seller sells this product currently for $10.78 which saves you over 40 percent. So you may want to shop around for a lower price compared to the manufacturer’s current price. We could not find any information about a guarantee. We looked on the website but could only find a “Contact Us” option. If you were interested about whether or not the company does have a return policy or guarantee, you would have to inquire first, or purchase from another retailer seller who honors a guarantee. This can prove to be a hassle since it would be inconvenient for you to search all over the web to find a return policy which is suitable for you. The testimonials are overall positive. It seems many mothers who are breastfeeding seem to use this to increase their breast milk production. Others purchase it to help have a boost in energy. 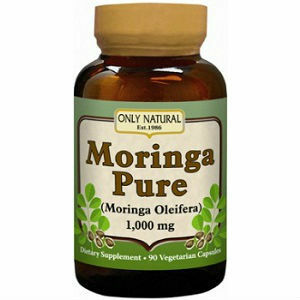 Only Natural Moringa Pure is a dietary supplement which seems to be a solid product. It is an all natural supplement which is ideal for those who wish to find a homeopathic or natural way to improve their health and energy. It doesn’t have any preservatives or fillers which does not damper the potency of the product. However, there are a few things we discovered which did concern us. The different price ranges from different retailers was something we definitely took note of. In addition, we could little to no information about the product’s guarantee. While this product has garnered some very positive reviews, it doesn’t mean it will necessarily work for you. You want a product you can confidently purchase without having the fear of losing your money if it does not work for you. Due to this, we do not think this is the ideal product for you. Michael Hall	reviewed Only Natural Moringa Pure	on November 30th	 and gave it a rating of 3.5.